Holy Crap—Look at All These SR-71 Blackbirds Together! Like Richard Gottardo says: this image reaches a "maximum amount of awesomeness." Eleven! 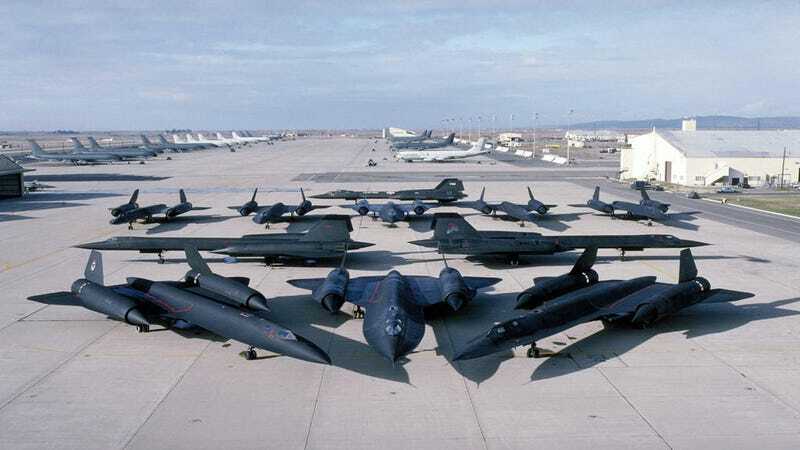 Lockheed Martin SR-71 Blackbirds—perhaps the the most exhilarating piece of flying titanium ever to touch the sky along with the Oxcart A-12—"posing" together. In April 1986, following an attack on American soldiers in a Berlin disco, President Reagan ordered the bombing of Muammar Qaddafi's terrorist camps in Libya. My duty was to fly over Libya and take photos recording the damage our F-111's had inflicted. Qaddafi had established a 'line of death,' a territorial marking across the Gulf of Sidra , swearing to shoot down any intruder that crossed the boundary. On the morning of April 15, I rocketed past the line at 2,125 mph. I was piloting the SR-71 spy plane, the world's fastest jet, accompanied by Maj Walter Watson, the aircraft's reconnaissance systems officer (RSO). We had crossed into Libya and were approaching our final turn over the bleak desert landscape when Walter informed me that he was receiving missile launch signals. I quickly increased our speed, calculating the time it would take for the weapons-most likely SA-2 and SA-4 surface-to-air missiles capable of Mach 5 - to reach our altitude. I estimated that we could beat the rocket-powered missiles to the turn and stayed our course, betting our lives on the plane's performance. After several agonizingly long seconds, we made the turn and blasted toward the Mediterranean 'You might want to pull it back,' Walter suggested. It was then that I noticed I still had the throttles full forward. The plane was flying a mile every 1.6 seconds, well above our Mach 3.2 limit. It was the fastest we would ever fly. I pulled the throttles to idle just south of Sicily , but we still overran the refueling tanker awaiting us over Gibraltar. Twenty-nine years later, I stood awe-struck in a Beale Air Force Base hangar, staring at the very real SR-71 before me. I had applied to fly the world's fastest jet and was receiving my first walk-around of our nation's most prestigious aircraft. In my previous 13 years as an Air Force fighter pilot, I had never seen an aircraft with such presence. At 107 feet long, it appeared big, but far from ungainly. In 1962, the first Blackbird successfully flew, and in 1966, the same year I graduated from high school, the Air Force began flying operational SR-71 missions. I came to the program in 1983 with a sterling record and a recommendation from my commander, completing the weeklong interview and meeting Walter, my partner for the next four years He would ride four feet behind me, working all the cameras, radios, and electronic jamming equipment. I joked that if we were ever captured, he was the spy and I was just the driver. He told me to keep the pointy end forward. One day, high above Arizona , we were monitoring the radio traffic of all the mortal airplanes below us. First, a Cessna pilot asked the air traffic controllers to check his ground speed. 'Ninety knots,' ATC replied. A twin Bonanza soon made the same request. 'One-twenty on the ground,' was the reply. To our surprise, a navy F-18 came over the radio with a ground speed check. I knew exactly what he was doing. Of course, he had a ground speed indicator in his cockpit, but he wanted to let all the bug-smashers in the valley know what real speed was 'Dusty 52, we show you at 620 on the ground,' ATC responded. The situation was too ripe. I heard the click of Walter's mike button in the rear seat. In his most innocent voice, Walter startled the controller by asking for a ground speed check from 81,000 feet, clearly above controlled airspace. In a cool, professional voice, the controller replied, ' Aspen 20, I show you at 1,982 knots on the ground.' We did not hear another transmis sion on that frequency all the way to the coast. One moonless night, while flying a routine training mission over the Pacific, I wondered what the sky would look like from 84,000 feet if the cockpit lighting were dark. While heading home on a straight course, I slowly turned down all of the lighting, reducing the glare and revealing the night sky. Within seconds, I turned the lights back up, fearful that the jet would know and somehow punish me. But my desire to see the sky overruled my caution, I dimmed the lighting again. To my amazement, I saw a bright light outside my window. As my eyes adjusted to the view, I realized that the brilliance was the broad expanse of the Milky Way, now a gleaming stripe across the sky. Where dark spaces in the sky had usually existed, there were now dense clusters of sparkling stars Shooting stars flashed across the canvas every few seconds. It was like a fireworks display with no sound. I knew I had to get my eyes back on the instruments, and reluctantly I brought my attention back inside. To my surprise, with the cockpit lighting still off, I could see every gauge, lit by starlight. In the plane's mirrors, I could see the eerie shine of my gold spacesuit incandescently illuminated in a celestial glow. I stole one last glance out the window. Despite our speed, we seemed still before the heavens, humbled in the radiance of a much greater power. For those few moments, I felt a part of something far more significant than anything we were doing in the plane. The sharp sound of Walt's voice on the radio brought me back to the tasks at hand as I prepared for our descent. With the Libyan coast fast approaching now, Walt asks me for the third time, if I think the jet will get to the speed and altitude we want in time. I tell him yes. I know he is concerned. He is dealing with the data; that's what engineers do, and I am glad he is. But I have my hands on the stick and throttles and can feel the heart of a thoroughbred, running now with the power and perfection she was designed to possess. I also talk to her. Like the combat veteran she is, the jet senses the target area and seems to prepare herself. For the first time in two days, the inlet door closes flush and all vibration is gone. We've become so used to the constant buzzing that the jet sounds quiet now in comparison. The Mach correspondingly increases slightly and the jet is flying in that confidently smooth and steady style we have so often seen at these speeds. We reach our target altitude and speed, with five miles to spare. Entering the target area, in response to the jet's new-found vitality, Walt says, 'That's amazing' and with my left hand pushing two throttles farther forward, I think to myself that there is much they don't teach in engineering school. Only the Mach indicator is moving, steadily increasing in hundredths, in a rhythmic consistency similar to the long distance runner who has caught his second wind and picked up the pace. The jet was made for this kind of performance and she wasn't about to let an errant inlet door make her miss the show. With the power of forty locomotives, we puncture the quiet African sky and continue farther south across a bleak landscape. Walt continues to update me with numerous reactions he sees on the DEF panel. He is receiving missile tracking signals. With each mile we traverse, every two seconds, I become more uncomfortable driving deeper into this barren and hostile land. I am glad the DEF panel is not in the front seat. It would be a big distraction now, seeing the lights flashing. In contrast, my cockpit is 'quiet' as the jet purrs and relishes her new-found strength, continuing to slowly accelerate. The spikes are full aft now, tucked twenty-six inches deep into the nacelles. With all inlet doors tightly shut, at 3.24 Mach, the J-58s are more like ramjets now, gulping 100,000 cubic feet of air per second. We are a roaring express now, and as we roll through the enemy's backyard, I hope our speed continues to defeat the missile radars below. We are approaching a turn, and this is good. It will only make it more difficult for any launched missile to solve the solution for hitting our aircraft. I push the speed up at Walt's request. The jet does not skip a beat, nothing fluctuates, and the cameras have a rock steady platform. Walt received missile launch signals. Before he can say anything else, my left hand instinctively moves the throttles yet farther forward. My eyes are glued to temperature gauges now, as I know the jet will willingly go to speeds that can harm her. The temps are relatively cool and from all the warm temps we've encountered thus far, this surprises me but then, it really doesn't surprise me. Mach 3.31 and Walt is quiet for the moment. I move my gloved finder across the small silver wheel on the autopilot panel which controls the aircraft's pitch. With the deft feel known to Swiss watchmakers, surgeons, and 'dinosaurs' (old- time pilots who not only fly an airplane but 'feel it'), I rotate the pitch wheel somewhere between one-sixteenth and one-eighth inch location, a position which yields the 500-foot-per-minute climb I desire. The jet raises her nose one-sixth of a degree and knows, I'll push her higher as she goes faster. The Mach continues to rise, but during this segment of our route, I am in no mood to pull throttles back. Walt's voice pierces the quiet of my cockpit with the news of more missile launch signals. The gravity of Walter's voice tells me that he believes the signals to be a more valid threat than the others. Within seconds he tells me to 'push it up' and I firmly press both throttles against their stops. For the next few seconds, I will let the jet go as fast as she wants. A final turn is coming up and we both know that if we can hit that turn at this speed, we most likely will defeat any missiles. We are not there yet, though, and I'm wondering if Walt will call for a defensive turn off our course. With no words spoken, I sense Walter is thinking in concert with me about maintaining our programmed course. To keep from worrying, I glance outside, wondering if I'll be able to visually pick up a missile aimed at us. Odd are the thoughts that wander through one's mind in times like these. I found myself recalling the words of former SR-71 pilots who were fired upon while flying missions over North Vietnam They said the few errant missile detonations they were able to observe from the cockpit looked like implosions rather than explosions. This was due to the great speed at which the jet was hurling away from the exploding missile. There seems to be a confirmed trust now, between me and the jet; she will not hesitate to deliver whatever speed we need, and I can count on no problems with the inlets. Walt and I are ultimately depending on the jet now - more so than normal - and she seems to know it. The cooler outside temperatures have awakened the spirit born into her years ago, when men dedicated to excellence took the time and care to build her well. With spikes and doors as tight as they can get, we are racing against the time it could take a missile to reach our altitude. The TDI now shows us Mach numbers, not only new to our experience but flat out scary. Walt says the DEF panel is now quiet, and I know it is time to reduce our incredible speed. I pull the throttles to the min 'burner range and the jet still doesn't want to slow down. Normally the Mach would be affected immediately, when making such a large throttle movement, but for just a few moments old 960 just sat out there at the high Mach, she seemed to love and like the proud Sled she was, only began to slow when we were well out of danger.